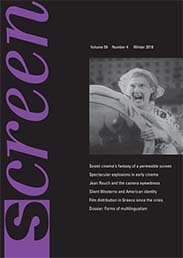 Screen is the leading international journal of academic film and television studies. From video art to popular television, from Hollywood to Hong Kong, from art cinema to British film finance, Screen authors cover a wide range of issues, both contemporary and historical, from a variety of disciplinary perspectives. For Beauvoir, the cinema was a crucial ingredient in her coming of age as an intellectual woman, a medium and a venue into which she delved into both for narrative escape and for philosophical sharpening. “Concert, painting, theater, cinema, literature,” de Beauvoir wrote in her diary in October 1927. “With all that, continue to write my book.” A voracious consumer of art, de Beauvoir documented in diaries from her years as a student at the Sorbonne her philosophical interest in the cinema. While Simone de Beauvoir never distilled her observations on the film into a single book or essay, she referenced the cinema throughout nearly six decades of public and private writings. Dr. Lauren Du Graf holds a PhD in English and comparative literature from the University of North Carolina at Chapel Hill, where she was a member of the Royster Society of Fellows. She currently holds a position as a postdoctoral research fellow at the Beinecke Rare Book and Manuscript Library at Yale University, where her research specialises in 20th and 21st century literature and film, adaptation, documentary, feminist film theory, and global modernisms. Her article on Cinema in the eyes of Simone de Beauvoir was published in Screen in 2018.